Over the last couple of years I’ve been lucky enough to have accumulated a fair amount of Avios points. However, the great thing about upgrading with Avios is that you don’t need a massive pot of points to experience a British Airways upgrade. What’s even better is that by using Avios to upgrade in this fashion you’ll be receiving excellent value for the Avios points you redeem. Read on to find out just how easy it is to redeem points to upgrade British Airways flights with Avios and we promise to throw in a couple of tips to ensure those hard-earned points take you further for less! One of the golden rules of ‘Upgrading Using Avios’ is that you can ONLY upgrade a cash-bought British Airways ticket to the next class of service if there is Avios availability in that class. That means if you purchased a flexible economy ticket (importantly we’ll touch upon why it cannot be either Q, O and G later) you can only upgrade to premium economy – don’t get caught out by booking the wrong class or ticket type! Likewise premium economy can be upgraded to Business and Business can be upgraded to First. You can read about my recent British Airways Business Class flight here and more excitingly my recent BA First Class flight to Sao Paulo here. Both reviews provide step-by-step guides to enable you to earn enough points to redeem either a Business or First Class flight for less than the price of an economy ticket! 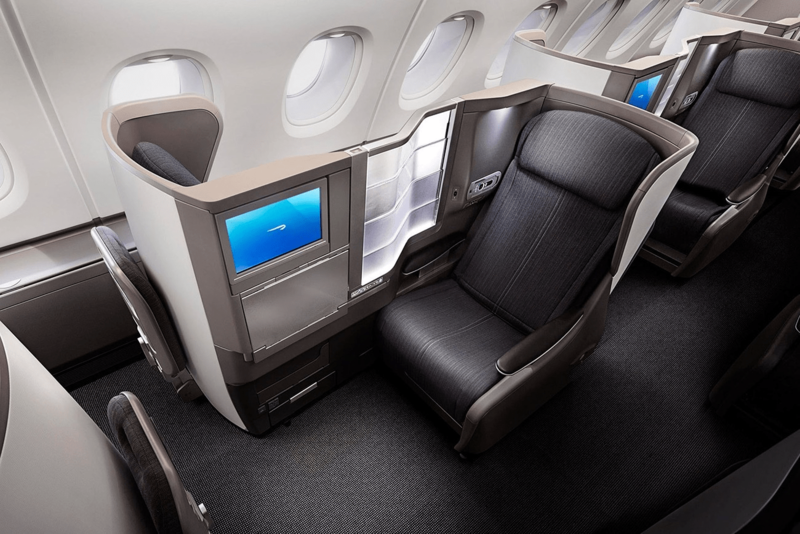 Why Upgrade with Avios on British Airways? What Tickets are Available for Upgrade? How Many Points to Upgrade? Can You Upgrade with Avios on Other Airlines? Can You Use the BA 2-4-1 Voucher? There are of course many reasons you may want to fly Business Class over say premium economy. Fly flat beds, lounge access, larger seats, superior food and drink, the list goes on and on. Option One (Cash Booking): As we can see from the below a return direct cash ticket would cost somewhere in the region of £2,135. 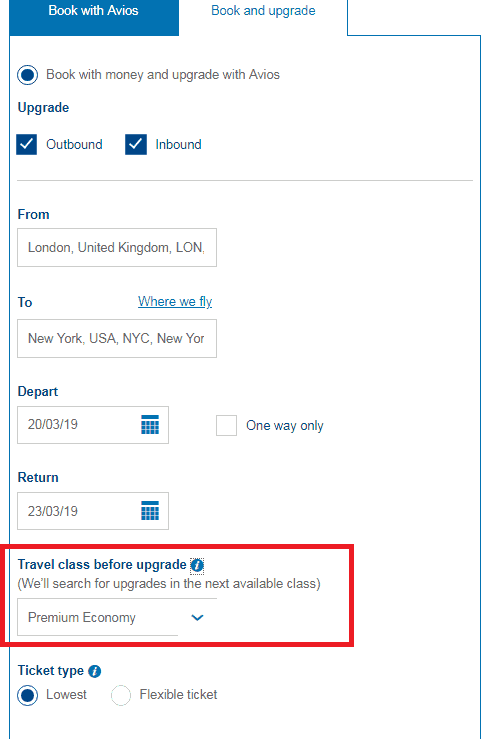 Option Two (Upgrade with Avios): To book the flight on the same day in premium economy using Avios to upgrade, head to the ‘book and upgrade’ section of the BA website here. As you can see from the below, to upgrade the British Airways flight with Avios would require 48,000 Avios and a further £1,499 in cash. As such by using 48,000 Avios you could make a cash saving of £636, which equates to 1.3p for every Avios used. Option Three (Using all Avios): The final option would be to book the whole flight using Avios. You’ll still need to pay taxes so in this instance the total cash saving would be £1,466 by using 110,000 Avios points. This equates to an almost identical redemption value of 1.3p per Avios point used. As we can see from the above, both redemption scenarios result in a points value of 1.3p, which is actually better than the 1p I usually aim for. As such, if you only collect a small number of points each year, upgrading with Avios can be a great way of unlocking BA Business Class flights. Don’t forget that if you choose option two and upgrade British Airways flights with Avios you’ll also earn tier points and Avios on the premium economy ticket you’ve booked. With 6,916 Avios earned from a return premium economy flight to New York for a Blue (entry level) BA Executive Club member, the net number of points used would actually be 41,084 Avios (48,000 less 6,916). With a saving of £636 this would result in a points value of 1.55p, exceeding the value achieved if you were just to use Avios points. With Avios values ranging from 1.3p to 1.5p in the examples above, this helps to highlight the value of some excellent sign-up bonuses offered by UK credit card providers. The (free for the first year) American Express Gold Card (reviewed in full here) offers a 20,000 sign-up bonus when you spend £2,000 in the first 3 months. These can easily be transferred to your BA executive account at a rate of 1:1. Even based on the lowest value of 1.3p, this sign-up bonus is likely to be worth in the region of £260 – not bad for spending on a free card. What’s even better is that you can currently receive a 2,000 bonus if you use this link. One of the main disadvantages of upgrading flights with Avios is that economy tickets are almost impossible to upgrade. You’re unable to upgrade the cheapest economy tickets classed Q, O or G which actually means that it can quite often be cheaper to just book premium economy with cash rather than using points to upgrade. As with everything, there are various terms and conditions you should be aware of when seeking to book a British Airways Avios upgrade. I’ve summarised these below but it’s always worth taking a look at the BA Upgrade Using Avios T&Cs here. As mentioned earlier, you can only upgrade your ticket by one class. I.e. Economy to Premium, Premium to Business, Business to First. You’re only able to upgrade with Avios in advance. This means you can’t redeem at the airport or on board the flight. You can either upgrade your flight at the time of booking (using the Book & Upgrade page here) or alternatively once you’ve booked via the ‘ Manage My Booking’ page here. You can only upgrade British Airways flights with Avios (with the exception of some American Airlines and Iberia flights which I’ll touch upon later). You can only upgrade if there is Avios availability in the class above. As mentioned earlier, you’re unable to upgrade the lowest cost economy seats (fare bucket Q, O or G). You can however upgrade all premium economy and Club World tickets. It’s possible to upgrade one leg of the journey at a time. This helps when there’s limited availability. Should further seats become available you can then upgrade your remaining leg at any time. By using Avios to upgrade, you’ll only receive the tier points and Avios of the cash ticket purchased. BA holidays are generally not upgradeable with Avios as they are booked as either Bulk Tour (BT) or Inclusive Tour (IT). Most other travel agent tickets are capable of being upgraded with Avios (do check with your agent though!). When upgrading using Avios the amount of points required is the difference between the original ticket and the upgraded ticket. Let’s take New York again as an example which falls into Zone 5. To upgrade from premium economy to Business during off-peak times would require 24,000 Avios points. The crazy thing is that to upgrade during peak times you’d only need 20,000 Avios points. Less than off-peak – which doesn’t make much sense! Don’t forget you can easily earn at least 20,000 Avios points by signing up to the American Express Gold Card (reviewed here)! In Business Class you’ll also have to pay additional fuel surcharge and taxes, so it’s unfortunately always slightly more than just booking a premium economy ticket and upgrading. There are two opportunities to upgrade with Avios. The first is during the booking process and the subsequent option is once you’ve booked, using the ‘Manage My Booking’ page on the BA website. Step One: Start by heading to the ‘Book a Flight Using Avios’ page (found here for ease). This can be found in the Book tab on the BA Home Page. 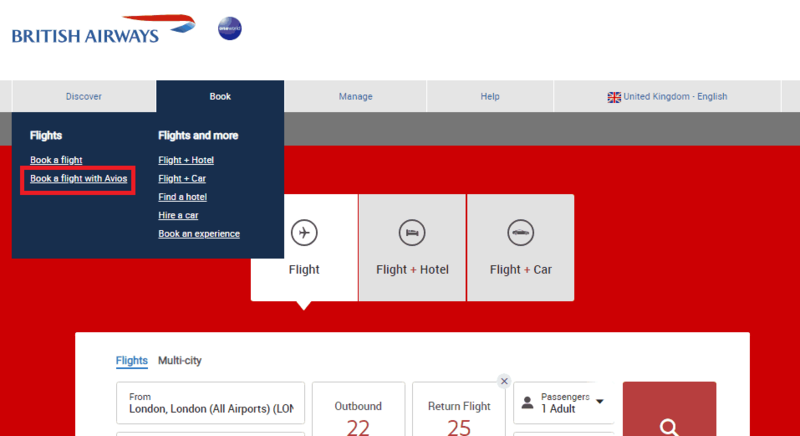 Step Two: You’ll then need to use the Book and Upgrade section of the BA website to use your Avios for a British Airways upgrade. A direct link to the Book and Upgrade page can be found here. Step Three: Enter the details of the flight you’d like to book with the class of travel BEFORE the upgrade. As I mentioned earlier, there needs to be reward redemption availability in the class above to upgrade a flight with Avios. If you’re trying to upgrade on a popular flight you may struggle to find availability. BA release a minimum of 2 reward tickets per class on every flight which, during peak times, are likely to be snapped up sharpish. 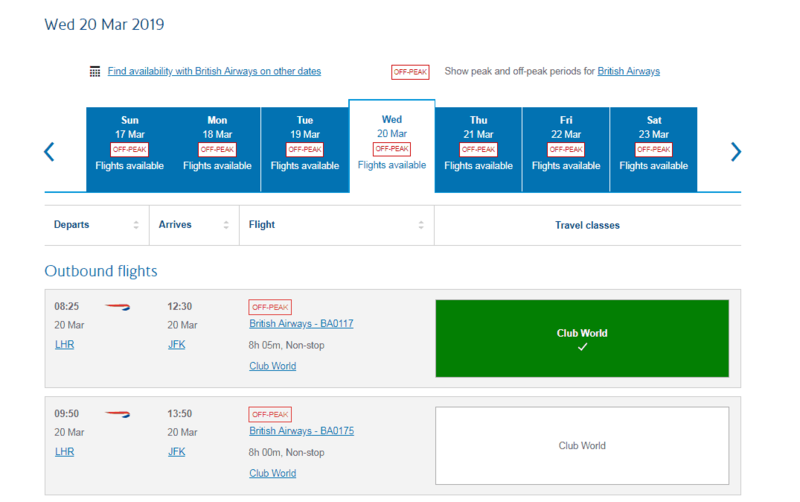 The easiest way to search for availability when upgrading with Avios is to head to BA redemption finder. Step Four: Finally select the flights you’d like to take and proceed to checkout. Simple as that. 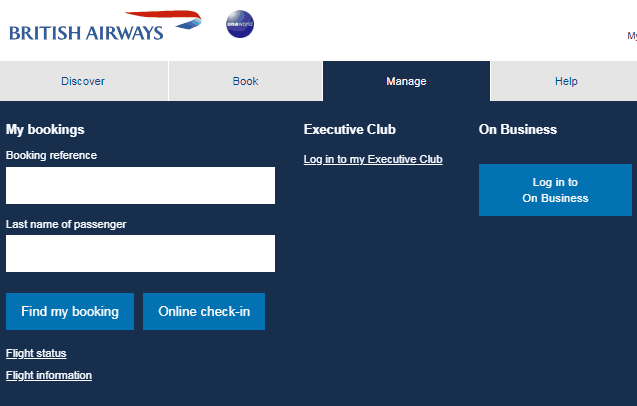 Step One: Once you’ve logged into your British Airways account, use the manage tab to find and ‘manage your booking’. 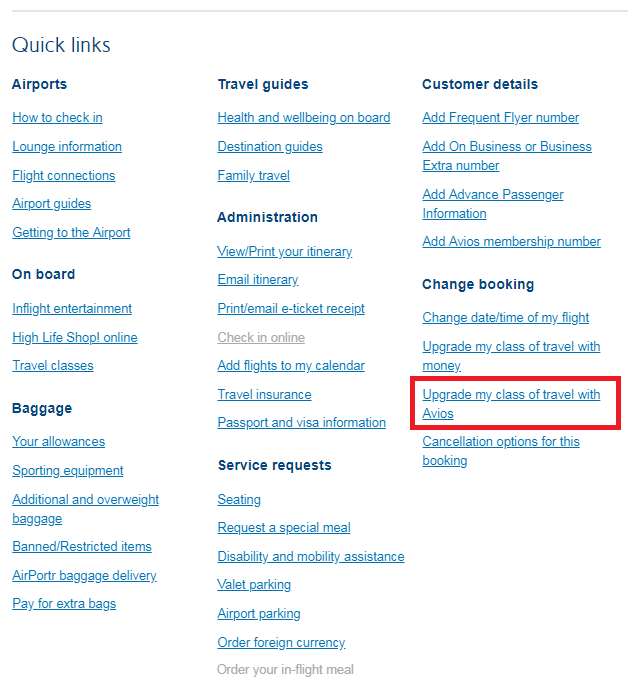 Step Two: On the ‘Manage my Booking’ page you’ll want to scroll to the bottom of the page and under the quick links section select the option to ‘Upgrade my class of travel with Avios’. If you’re eligible for an upgrade you will be taken through to a payment page where you’ll need to pay the remaining taxes and outstanding Avios points to upgrade with Avios. Remember though that there needs to be availability for you to be able to upgrade the flight. Yes, but it’s slightly more tricky. 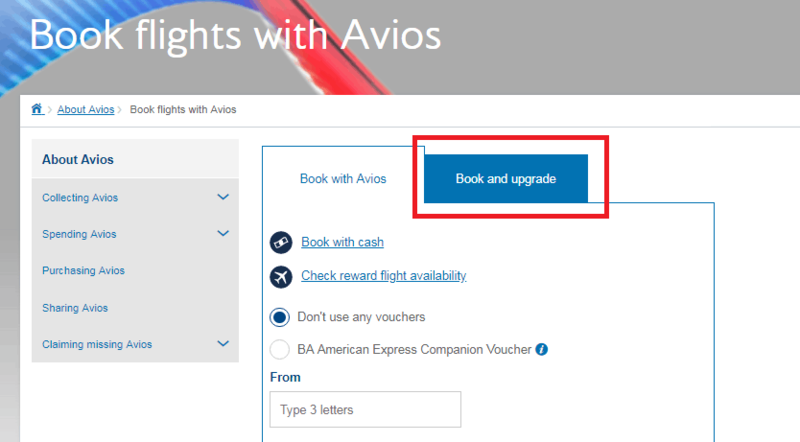 You can only upgrade using Avios if you have purchased your tickets directly through British Airways and the option is only available to upgrade on American Airlines and Iberia. Economy tickets will need to be fully flexible (either Y or B). To upgrade to First with American Airlines you must be holding a fully flexible Business Class ticket (J, C or D). This isn’t the case for British Airways flights, and Iberia doesn’t offer First Class. No. When using the British Airways 2-4-1 voucher which comes with the BA Amex or BA Premium Amex you need to be using 100% Avios. As regular readers may have heard before, the 2-4-1 voucher is probably the most generous credit card perk currently in the UK market. It allows the holder to essentially be able to reduce the number of Avios required for two people by half. This could save (or alternatively be worth) as much as 200,000 Avios points if used correctly. Whilst I’m usually adverse to paying for a premium credit card, you may find my recent review of the BA Premium Amex (found here) interesting as it shows using easy-to-follow maths that for most people the rewards far outweigh the cost of the card! We’ve seen that the process of upgrading with Avios can provide good value and allows those who collect a relatively small number of Avios each year to upgrade their tickets with ease. There are a couple of things to remember though… you CANNOT upgrade the majority of discount economy tickets. As such, it can actually be cheaper to book the premium economy ticket with cash as opposed to buying an expensive, fully flexible economy ticket and then upgrading with Avios. During peak dates it’s possible to upgrade a premium economy flight to Business Class from London to New York for as little as 20,000 Avios points. 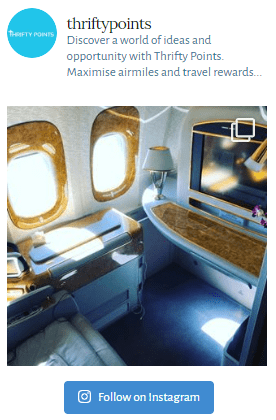 20,000 Avios points (22,000 if you use this link) are offered as a sign-up bonus with the (free for the first year) American Express Gold Card – worth considering if you are a few miles short. As always, we hope you’ve found this review interesting. Please do reach out or comment if you have any questions.